I have cherished picking fig fruits from my Brown Turkey (Ficus Carica) until this year. I had planted it in a big container last year. The beautiful big leaves on my fig tree provided some shade on the hot south wall of my southern California home. “Fig mosaic is a viral disease believed to be carried by eriophyid mites (Aceria fici). Symptoms first appear as a mottled, yellow pattern on affected foliage. The yellow spots sometimes become surrounded by rust-colored borders as the disease progresses. Some fig varieties also experience leaf deformation, premature leaf drop and stunted foliage or fruit growth. I had to destroy the plant. I talked with the plant manager of the store that had sold me the tree. He was willing to replace it with another fig tree. 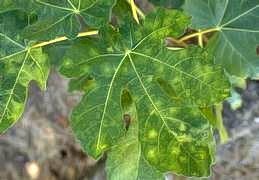 An examination of the plants at the nursery indicated that all of them were in early stages of developing the same spots on the leaves on the fig trees. I let the nursery plant manger know about the infestation. I am hoping that he would remove those infested plants and would destroy them and would not sell them. I am worried that the virus could infest the other plants in my landscape. You'll have to live with it like I do. I have a Black Mission fig tree and it has the virus but I get loads of big delicious fruit, as long as I get a look in from the birds!! We share!! I have 2 other fig tree grown from cuttings of a friend, don't know what varieties they are, but they have the virus and it took a year longer for them to come right and now the new growth is strong and the tress produce well. Just persevere. I read that a mite or aphids carry the virus and bite into tree,but it your trees are strong and healthy these bugs can't sink their teeth in, so to speak. So you can spray with an horticultural oil to suffocate them if you like. Anyhow if you have the virus, as I think every fig tree has or will get, just learn to get along with it and most importantly make sure you feed and water and protect your trees for them to be really strong and healthy so that they soon outwit this virus and then produce good clean growth and lotsandlotsa yummy figs for you and birds!! I had this in a 5-year-old Black Mission that was productive--did not want to destroy it. It still produces, does not appear to be any treatment to eradicate it, the bug-transfer issue may be at the root so spraying with an organic like "Take Down" oil+pyrethrin may help. On the same lot I have several green fig varieties that do not seem to be as affected, either 100% free or very minimally affected. Promoting the basic health of the plant looks most promising. Nothing has transferred to numerous other fruit-bearers adjacent, apricot, olive, grape or persimmon.